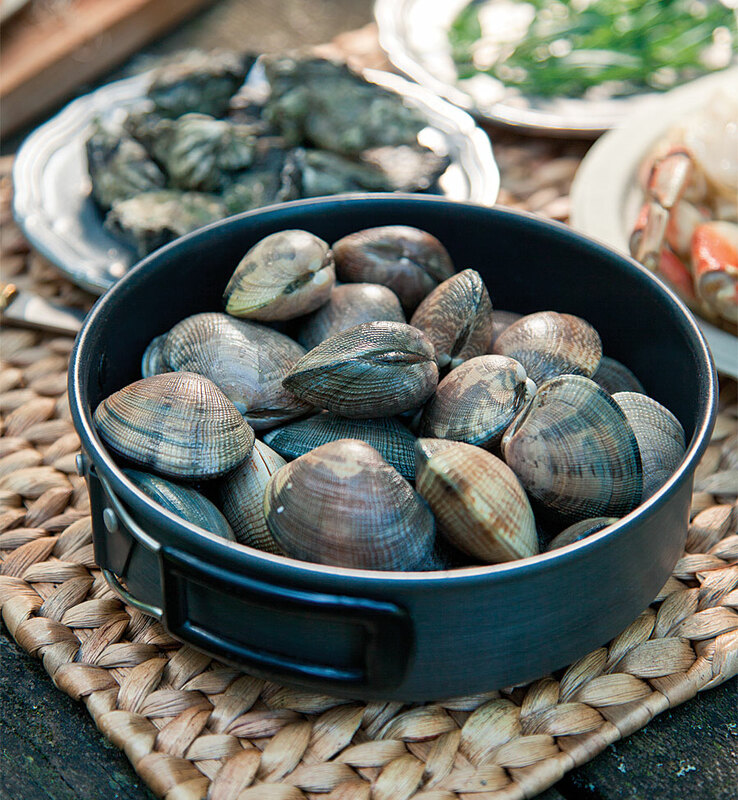 Taylor Shellfish Farms of Shelton, Washington, takes The Science of Where to Puget Sound to sustainably produce Manila clams, Pacific and Shigoku oysters, mussels, and geoduck. In Canada, Shock Trauma Air Rescue Service (STARS) uses The Science of Where to transport critically ill and injured patients via helicopter. The Chesapeake Conservancy in Annapolis, Maryland, puts The Science of Where to work to prioritize conservation efforts in the Chesapeake Bay. And The Science of Where gives Oakland County, Michigan, the ability to share information about topics as diverse as economic development, delinquent taxes, and opioid addiction. To accomplish all this, The Science of Where must be versatile, agile, and powerful. But what is this science? And from where does it derive its capabilities? 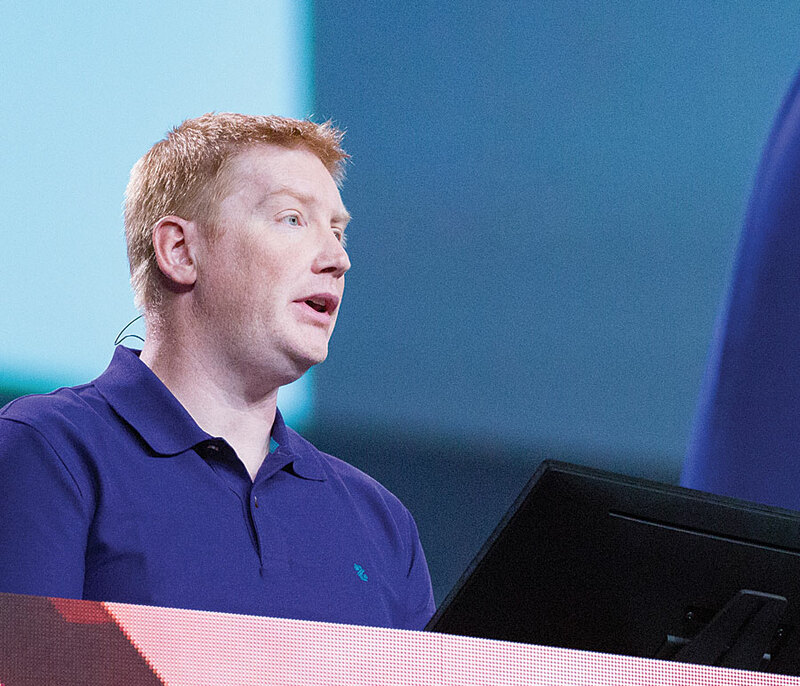 The answers to these questions came at the 2017 Esri User Conference (Esri UC), the largest annual gathering of GIS users in the world. This year’s event, held in July in San Diego, California, drew almost 18,000 people from the United States, Canada, the United Arab Emirates, Japan, Germany, Ecuador, and dozens of other countries. “For this conference, we have a theme called The Science of Where,” said Esri president Jack Dangermond as he welcomed the crowd at a packed Plenary Session in the San Diego Convention Center. But the phrase is more than a mantra. Behind the words is a system of understanding driven by science, technology, and people. As a “metascience,” according to Dangermond, GIS is underpinned by geography, data science, modeling, analytics, visualization, and computer science. “At its heart, [GIS] is a system of insight where we can do spatial analytics, look at relationships, and approach problem-solving in a holistic way,” he said. HE Dr. Aisha Bint Butti Bin Bishr, director general of the Smart Dubai Office, showed the audience how GIS is making Dubai the happiest city on earth. Dangermond underscored the importance of people to The Science of Where, all working together to use GIS to confront problems such as pollution, loss of nature, climate change, food shortages, social conflict, and natural disasters. Keynote speaker Dr. Geoffrey West, a renowned theoretical physicist, encouraged the audience to think about how we sustainably organize society, given that clusters of people—cities—put intense pressure on the world’s resources while they also facilitate innovation. “We are going to have to do everything we possibly can to better understand and…collaborate to address [these issues],” Dangermond said—just like the city of Dubai is with its Smart Dubai program. As HE Dr. Aisha Bint Butti Bin Bishr, director general of the Smart Dubai Office, and her colleagues demonstrated, GIS—and the cooperation that it cultivates—is a key element of making the emirate safer; more seamless; and, ultimately, the happiest city on earth. Although Taylor Shellfish Farms has only been using Esri technology for a year, it has implemented a suite of software and apps to lead its digital transformation. 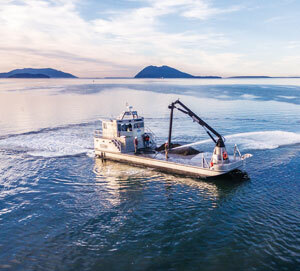 Location has always been critical to Taylor Shellfish Farms, which grows shellfish sustainably on 12,000 acres of leased or owned tide land and owns and operates three oyster bars in Seattle. Yet this fifth-generation, family-owned business has only been employing Esri technology for one year. 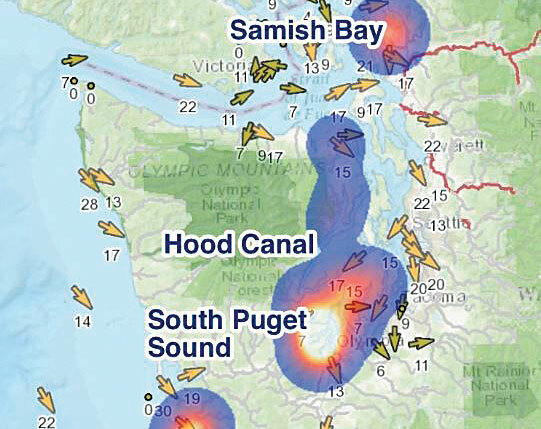 The Taylor family and employees now use GIS to map their 30 farming sites, analyze farming conditions, identify the best growing areas for different shellfish species, and conduct surveys to meet environmental requirements. Taylor Shellfish Farms didn’t start small. Since September 2016, the company has adopted ArcGIS Online; ArcGIS Pro; Esri Story Maps; Drone2Map for ArcGIS; and multiple mobile apps including Explorer for ArcGIS, Survey123 for ArcGIS, Collector for ArcGIS, and Workforce for ArcGIS. “In Samish Bay, the tide can recede over a mile to expose large, sandy tidal flats rich with nutrients. We grow oysters, clams, and geoduck here,” said Nyle Taylor, the farm’s project coordinator, who stressed that the word geoduck is actually pronounced “gooey duck.” In this bay and others, farm managers can view a map of farming areas on their smartphones and add information to it—using a sketching tool, for example, to suggest areas where the farm might expand. Photo courtesy of Taylor Shellfish Farms. With Survey123, Ewald can quickly configure digital surveys that workers use to collect environmental and other data for regulatory agencies. And Taylor Shellfish Farms now also maps out where to plant shellfish using drone-captured imagery processed with Drone2Map. At Shock Trauma Air Rescue Service, planning for dynamic situations is how the Canadian nonprofit provides emergency medical care and transport to seriously ill and injured people. With The Science of Where, STARS can better manage its response to these emergencies. Operating mainly in remote areas of Alberta, British Columbia, Saskatchewan, and Manitoba, STARS helicopters are dispatched to medical emergencies such as heart attacks; strokes; and traffic, recreational, or industrial accidents. Much of the critical work goes on at the organization’s Emergency Link Center (ELC), a 24-hour medical communications and dispatch center. That’s where Kevin Hatch and Paul Wiles work, building technology that speeds up response times. Kevin Hatch of Canada's Shock Trauma Air Rescue Service (STARS) helped build GIS technology that speeds up response times. 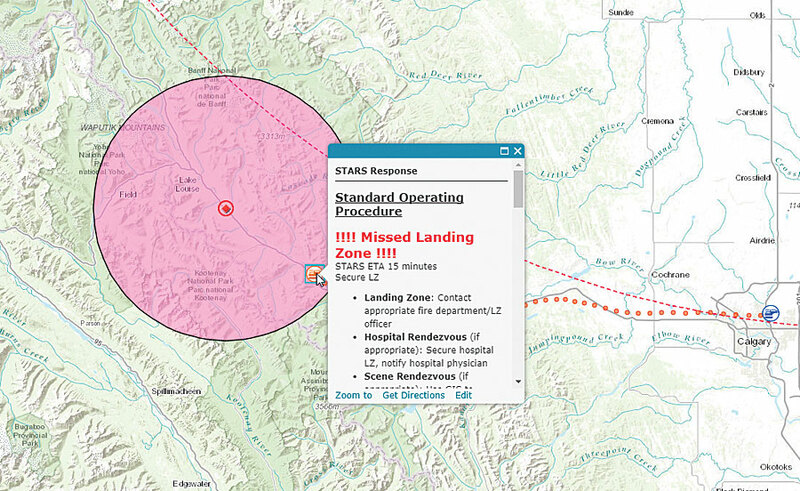 For example, STARS is using GIS to automate the standard operating procedures (SOPs) it follows to determine whether a helicopter needs to be sent to an incident. “We use a dynamic set of SOPs to tell our dispatchers precisely what they need to know so they can make that decision,” Hatch, a telecommunication specialist for STARS, told the audience. To illustrate how dynamic SOPs can help once a mission is under way, Hatch showed the audience a one-car rollover in Banff National Park. STARS decided to send a helicopter to the scene, where two people were trapped in a vehicle and a third person had been ejected. 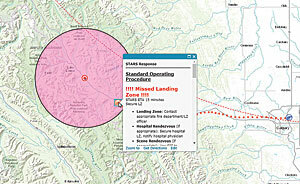 ArcGIS GeoEvent Server alerts STARS dispatchers if they miss an action, such as securing a landing zone. “Now [that] we’ve assigned a resource, GeoEvent has created a new feature, which uses the AVL [automatic vehicle location] of the helicopter,” Hatch said. “Using factors such as the status of the aircraft and the base [from which] it was dispatched, the SOPs are instructing the dispatcher to perform actions such as giving updates to our pilots and air medical crews.” GeoEvent Server will even alert a dispatcher if an action, such as securing a landing zone, is missed. At the Chesapeake Conservancy, it’s all about the bay—the Chesapeake Bay. The largest estuary in the United States and the third largest in the world, the Chesapeake Bay stretches 200 miles along the mid-Atlantic coast. The watershed that feeds it occupies more than 64,000 square miles in six states and is home to more than 18 million people. For a century, the health of the Chesapeake Bay was beset by pollution, population growth, and changes in land use. Over the last four decades, focused efforts have brought the bay back from the brink of destruction. 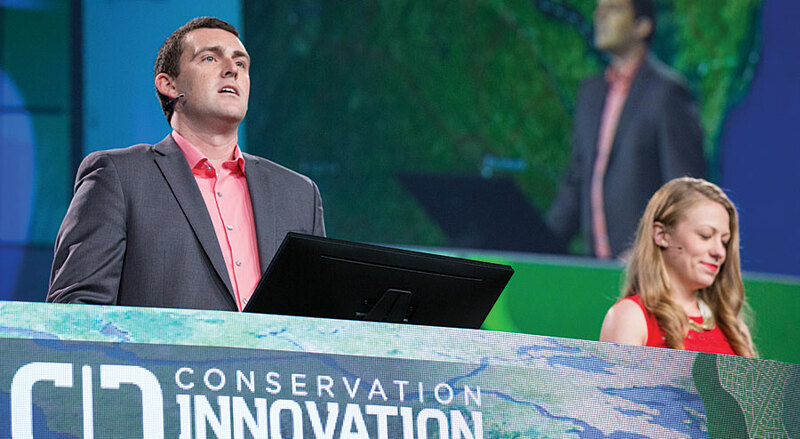 Jeff Allenby and Cassandra Pallai demonstrated the Chesapeake Conservancy's high-resolution land-cover dataset for the Chesapeake Bay watershed. “But we still have a long way to go,” said Jeff Allenby, director of conservation technology for the Chesapeake Conservancy. Given that so many cities, counties, and states have a stake in restoring the Chesapeake Bay, the conservancy has embraced technology to prioritize restoration projects. While datasets like the National Land Cover Database have informed regional cleanup efforts, smaller entities were using different sets of data. This made it difficult to implement targeted conservation projects. For 18 months, the conservancy worked for the Chesapeake Bay Program and with partners such as the University of Vermont Spatial Analysis Laboratory and WorldView Solutions Inc. to create an ultra-high-resolution land-cover dataset for the entire watershed. It was released in December 2016. Almost immediately, the conservancy’s partners began asking when it was going to update the data. But this was costly and time-consuming. So, using ArcGIS Pro, the Chesapeake Conservancy employed imagery from the National Agriculture Imagery Program (NAIP) to create a new false-color image of the region and segment it, streamlining the entire land classification workflow into one processing model. “ArcGIS Pro is reducing the amount of time that it takes us to go from raw imagery to land cover,” Allenby told the audience. To classify more than two terabytes of the most recent NAIP imagery, it would take the conservancy just over 150 hours instead of more than 2,500 hours. Additionally, the conservancy can classify land cover in just one area or, using ArcGIS Image Server in Microsoft Azure, create land-cover classifications for all 206 counties in the watershed. This enables the conservancy and its partners to better understand how development in one place might affect the entire bay. Oakland County, Michigan, is working with its own municipalities by expanding GIS use beyond the knowledgeable few. The county can build a map or app once, pay for it once, and allow everyone to benefit. “Through Web GIS, we’ve grown our distributed GIS model by combining the value of our many collaborative systems of record [into] a powerful system of systems, which allows us…to branch out to all our municipalities, businesses, and citizens,” said Phil Bertolini, Oakland County’s deputy county executive and chief information officer. He showed the audience the Access Oakland Open Data Portal, which uses maps to promote economic programs and attract new businesses. The Medical Main Street map, for example, underscores Oakland County’s thriving health care industry, and Global Oakland markets southeastern Michigan as an advantageous destination for businesses from around the world to open new locations. “To date, we have more than 400 new businesses located in Oakland County with an economic investment of $3.9 billion,” said Bertolini. The success of these open data initiatives spurred Bertolini to challenge his team to build up a new generation of GIS users in Oakland County. 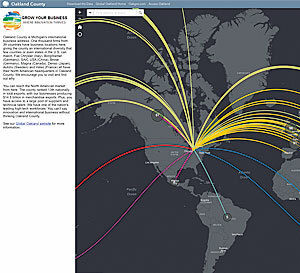 The Global Oakland web app markets Michigan as a great place for businesses from around the world to open new locations. “We found that some branches grow through our cultivation, whereas others sprout almost entirely on their own,” said Oakland County IT business analyst Mike Dagle, who, along with Shepherd, took the audience on a tour of how Oakland County transformed its GIS. 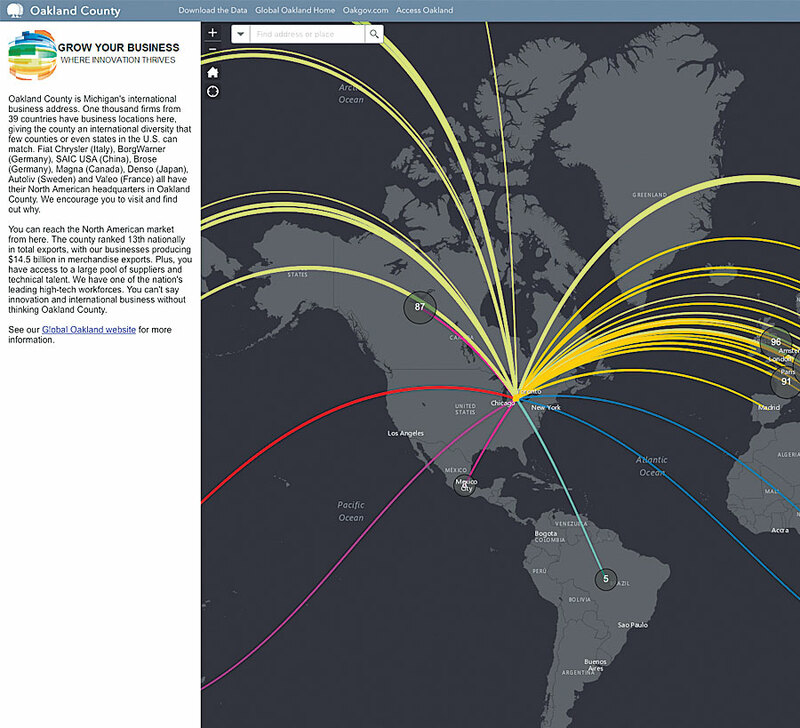 The team helped social media managers incorporate colorful maps into their Facebook, Twitter, and blog posts. It created a suite of apps to simplify how the tax administration department stakes notices on the properties of citizens who have not paid their taxes. Shepherd and Dagle and their colleagues helped the equalization division create an internal app that displays all the details about county properties, including parcel acreage, wetlands, and historical imagery. The team then added this app to its suite of standard product offerings, making it available for any municipality in the county to use and customize. GIS is now central to how Oakland County’s water resources commissioner’s office manages its assets, with the ArcGIS GeoAnalytics Server helping it prioritize and allocate scarce infrastructure resources. And finally, GIS maps and apps assist the county’s public health office in administering and offering resources for residents affected by the opioid crisis. Hundreds of thousands of other organizations around the world employ GIS and The Science of Where—including the United Parcel Service to optimize delivery routes and the emirate of Abu Dhabi to enhance government operations. The kind of holistic thinking they do is the only way to confront this planet’s great challenges and turn things around. And that is precisely the kind of thinking that GIS and The Science of Where make easier.